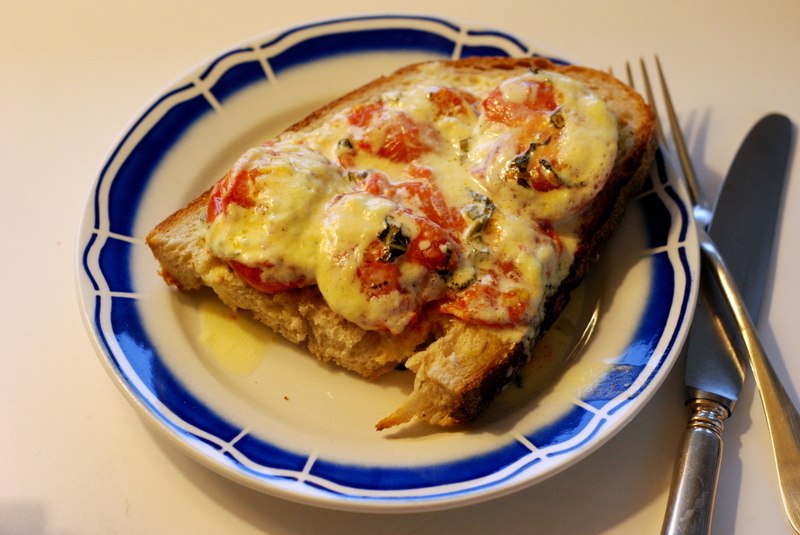 Creamed tomatoes on toast - it just sounds too dreamy, doesn't it? I have visions of sitting in a nursery and tucking into this and a mug of tea while a stern but loving governess speaks nasally about my table manners and tut tuts periodically. And while it really does seem promising, from Simon Hopkinson via Edouard de Pomiane, with tomatoes baked in the oven in a garlic-scented, mint-flecked cream bath, I am rather sad to admit that nursery food can sometimes be just that: fit for babies. I think I prefer my tomatoes loud and zesty, screaming with flavor, not baked into muted submission, which is kind of what happens here. Cream takes the edge of the tomatoes, but that edge is precisely what makes tomatoes so great. Right? I didn't use plum tomatoes, it's true, because they looked simply ghastly at the store and the lovely little Campari tomatoes were perfect. I tasted one before cooking it and it was delicious, so it's not that the tomatoes were bland, but of course Campari tomatoes are juicy as all get-out and plums are dry and meant for oven-baking. So that's one thing. Another is that I used half the amount of cream called for and I'd suggest you do the same unless you'd like to swill cream directly from the baking dish. You might! If I had a hardier constitution I would. The third thing is that no matter how hungry you are, if you do decide that this sounds like the kind of meal you'd like for lunch, please do a wait a bit before attacking your plate or else you will spend the rest of the afternoon with a dull, raised palate - hot tomatoes can be vicious. Just think of me as your governess. 1. Preheat the oven to 375 degrees. Simmer the cream with the garlic and reduce by one-third. 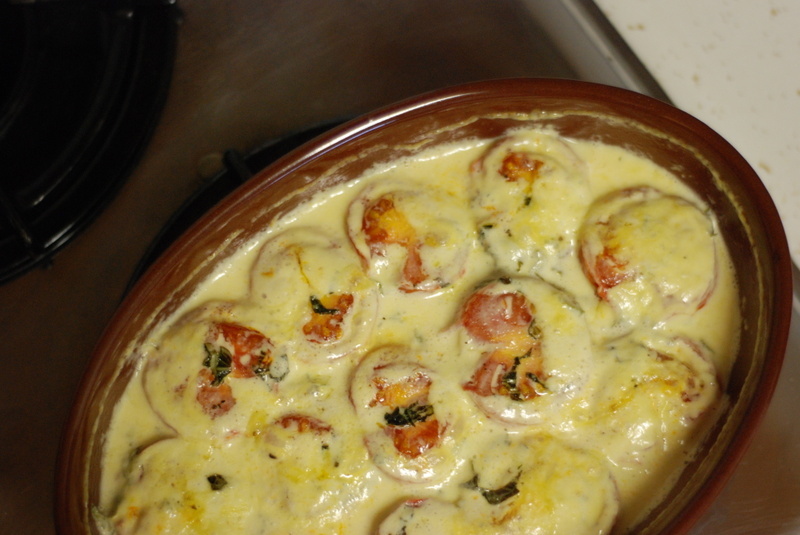 Put the tomatoes, cut-side uppermost, in an ovenproof dish and season them with salt and pepper. Strain the cream into a bowl and stir in the basil or mint. Lightly season and pour over the tomatoes. 2. 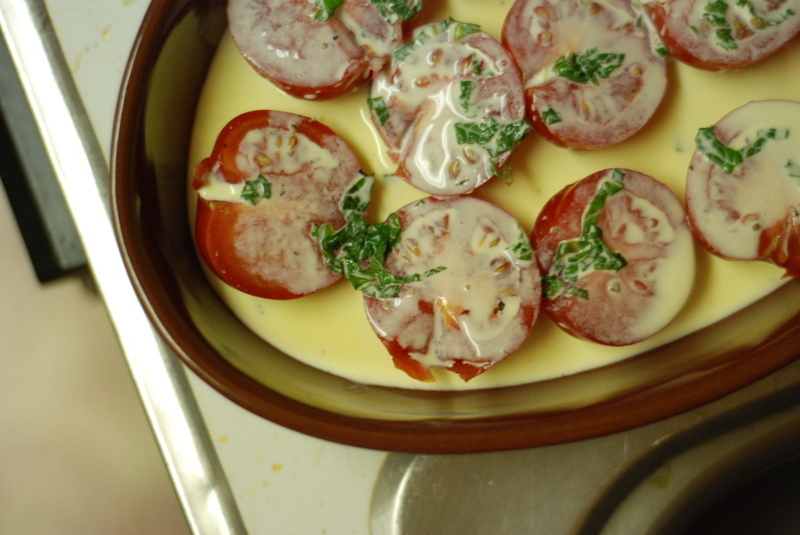 Bake in the oven for 20 to 25 minutes or until the cream is reduced and is thick and the tops of the tomatoes are slightly blistered. Meanwhile, have ready the toast on 2 plates and spoon a few tomatoes onto each slice. Spoon some residual cream over the top.